Los Mega Perros is hidden behind a Denny’s and a Chase Bank in a strip mall. I’ve had my eyes on this place for a little while. The one time I attempted to go during the day I could not find parking so I gave up. I decided it would be best to make my next attempt at night time which worked out well. I ordered a Maicito with Cheese (can of Corn topped with melted Mozzarella Cheese, Crushed Potato Chips and their Pink and Pineapple sauces), Papitas Francesas (French Fries), Mega Perro and the Mega Burger. The Maicito served at this place is superior to any other I’ve had. It has the right mix of Corn to Toppings. The fries, well they’re just your run of the mill thing. The Mega Perro is one of the best dogs I’ve tasted in all the Colombian fast food places I’ve been to. 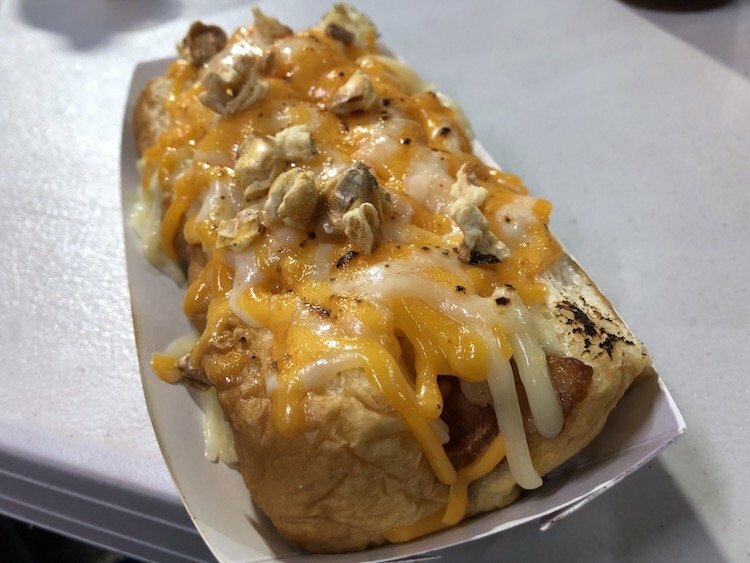 I suspect that this dog is a Sabrett (it comes with melted Mozzarella Cheese, Pink sauce, Pineapple sauce, and crushed Potato Chips). The Mega Burger has some nice seasoning on it. The problem is all the toppings (melted Mozzarella Cheese, Lettuce, Tomato, Pink sauce, Pineapple sauce, a slice of Ham and crushed Potato Chips) almost make you forget there’s a burger under there. At least the sauces aren’t overwhelming everything and the crushed Potato Chips are of course a nice touch. If you get a chance, swing by and check this place out but I definitely suggest you go at night. I went and tried the burger. Since I tend to get my burgers with just the basics (and usually bunless), I pay more attention to the taste of the meat. I got the burger with the bacon, ham and cheese and while the toppings were great, I thought the patty tasted like something out of a box. The rest of my entourage liked the Mega Perros with all the toppings. My wife and I came to try out the hot dog and burger, and both failed to catch any attention from either one of us. The dog, a thin frankfurter covered in crushed lays potato chips!? With only a little of the ‘pink sauce’ for toppings it fell a distant ways from the likes of the colombian hot dogs found at places like los perros, la moon, or mao.. the burger as described in another review, tasted out of a box, and again with no real flavor enhancers. The location looked clean and nice, so it might have been an off day for the kitchen… in either case, we took a snapshot of the place as a way to remember where we don’t need to return. Ok I went to try the famous mega perros & mega burgers that my friends told me about. The mega burger..not so good! I ordered it & gave it to my husband after just 1 bite. The mega perro, well that’s another story. I loved it. It tasted so good. I’m not a big fan of hot dogs, but that one, believe me is a good one! Oh! I put some pink & pineapple sauce on it…yum!!! !